4:15 Sr. Football: Cork v Christopher's - Christopher's (5 points) Christopher's over. 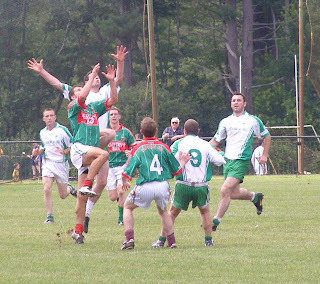 5:30 Sr. Football: Mayo v Wolfe Tones - Wolfe Tones (7 points) Wolfe Tones over. 1:15 Sr. Football: Shannon Blues v Armagh-Notre Dame - Shannon Blues (5 Points) Blues by 4 points. Donegal, Macs, and Christopher's looking good for senior playoffs. It looks like 12 points will be needed to ensure playoff spot. Shannon Blues and Wolfe Tones have to fight it out for the last place. Cork look like missing out entirely, while Mayo, Galway, Armagh-Notre Dame and the Gaels will duke it out for the last 2 intermediate playoff places. Kerry seem to be destined for the Inter semis. Tipp put the Wexford hex past them last Saturday afternoon, and now top the senior hurling table. 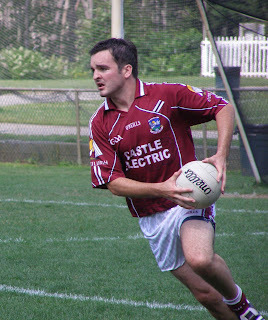 Galway were looking good, but their performance last Sunday was shaky while Tom's could make a late run at it. There is less between the teams in this year's senior hurling championship than in recent years. Stay tuned. McAnespies showed that they can learn from past experience, and along with some positional changes, brought an attitude to the game that was all business. Luke Sweetman started at midfield and Colm Donnelly at wing forward. Donnelly thrived with his newly found freedom on the wing in the first half, while the middle of the park might suit the skills of Sweetman more than the forward line where he had appeared in the past. In addition the back line was as tight as a fist and strangled the Donegal forwards, limiting some high caliber marksmen to a combined six points, two in the first half. Donegal have a pool of talent that is the envy of most clubs, but still are trying to find the right combination. Paddy Kelly did not start the game, and came in within 10 minutes as Donegal were struggling early on. 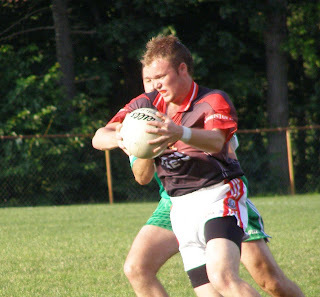 From the get go McAnespies put a stranglehold on their opponents and while Donegal managed to find some breathing room here and there in the second half, the Tir Chonaill men could not break the grip of the North American champions. Donegal's Eddie Mangan evades the reach of Neil Donaghy. McAnespies put four points over the bar before Kevin Curran opened Donegal’s account. Jamie Kelly, Alan Nestor, and Colm Donnelly (2) had McAnespies ahead after 15 minutes. 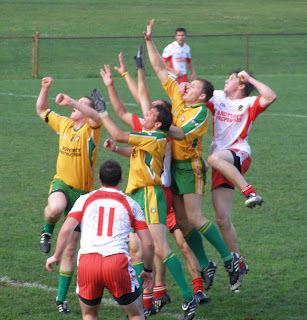 Indicative of the task that Donegal faced was the immediate response to Donegal’s opening score. Donnelly finished a sweeping move from the ensuing kickout. Donegal also had Fergal Murphy to thank for two outstanding saves to keep the ball out of the net. Both were shots from Jamie Kelly. Murphy parried the first powerful shot one over the bar, and on the second occasion Kelly tried to sneak the ball past Murphy, but Murphy got a trailing foot to the ball. Cahir Healy also saved Donegal’s bacon on another occasion as he blocked a close range Colm McCrory shot. Healy’s battle with McCrory was one of the few that Donegal could claim as a victory. Healy did an outstanding job on the McAnespies dangerman, but the problem from a Donegal viewpoint was that there were others needing stopping. One up for the ball lads! Sitting on a comfortable six point lead to start the second half, McAnespies had their work cut out to keep it. Donegal pushed harder on the door, but scores were in short supply and six points seemed double that. Eddie Mangan got a much needed point for Donegal the start the second period after three minutes, but McAnespies answered with a typically well worked score. Rory Maguire found Luke Sweetman, who served the ball to Mark McGovern on the overlap from wing back, and over the bar. Donegal lopped two points off the lead as the northerners started to win more possession and did a better job holding the McAnespies forwards in check. However, with the forwards quieter, each of the McAnespies half backs stepped up to point in the second half and maintain distance between the sides. Paddy Kelly put a fine individual effort over the bar and Michael McGinty reduced the lead to four points. McAnespies, however, answered in kind through Keith Hudson and McCrory. Donegal had to fight hard for every score, and Kelly put two more hard earned points over the bar. Time was a factor however, and Donegal did not have it on their side. David Wright saved well from substitute Robert Porter, and Donegal added another point from a Fergal Murphy 65. McAnespies continued to win and keep enough possession to maintain the advantage, and when given the chance slowed down the play. Neil McAdam put an insurance point over the bar with 26 minutes gone and by that stage a goal was needed for Donegal, and it looked unlikely that one would come. McAnespies kept the door shut and while enhancing their playoff position, ensured that Donegal’s chance of claiming top spot are lessened. The result leaves no team undefeated as Kerry put paid to Christopher’s unbeaten run in mid-week. Tom’s needed the win to get their challenge for a playoff place off the ground, and playing old rivals Galway provided plenty of motivation. Galway had some notable absences from their lineup and stuttered and stammered and never got any flow going while Tom’s displayed more conviction up front and in defence, as well as having the Maurice Callinan scoring machine to rely on. Two late goals in the first half put Tom’s into a comfortable lead at the break, and Galway never looked like making a game of it in the second. Fr. 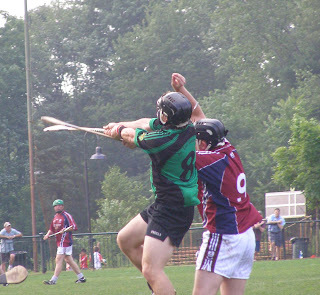 Tom's Cahir Healy and Galway's Evan Daniels contest a puckout. Tom’s got off to the best start possible with a goal after two minutes from Maurice Callinan. Playing at wing forward, Callinan proved to be a lucrative scoring outlet for Tom’s both from play and from the dead ball. Callinan followed up the goal with a pointed free after James Kinsella got Galway off the mark with a fine point. After Cahir Healy added to Tom’s lead with a point, Galway put a couple of chances from frees wide of the posts, a measure of how the afternoon would go for the maroon and white. There were yellows issued for a dangerous challenge from Tom’s Darryl Dooley and the reaction of Galway corner back, Peter Buckredge. The sides traded scores before Tom’s hit with a second goal from John Cuddy as Tom’s took advantage of some hesitation in the Galway defence. Shortly afterwards, Eanna Murphy, a goalscorer in Tom’s last outing, made it three in the goal column for Tom’s. Tom’s rode the wave until the half time whistle adding three more points from Callnan (2) and a fine long range strike from Cuddy. Trevor Kelly bursts through the Galway cover. The Gap between the teams remained unchanged for the next fifteen minutes. Galway made a better first of it in the second period and matched Tom’s in the points column, but a much needed goal did not come for the tribesmen. It almost did as Danny Fitzgerald first kicked the ball off the underside of the bar, and in the ensuing scramble Galway won a penalty. John Moylan took it well, but again, the crossbar denied Galway. Evan Daniels mopped up with a point, but that was not what Galway needed. John Moylan pointed twice, but as if to rub the salt in, substitute Ger Hennelly goaled for Tom’s with minutes left on the clock. A good day for Tom’s and one that Galway would rather forget as Tom’s junior’s also inflicted a heavy defeat on Galway’s reserves earlier in the day. Galway led from start to finish and survived a sending off late in the second half as Cork threatened to make a comeback. The result leaves Cork as the only team yet to win a game, and with three games still to play, Galway have a chance of an intermediate playoff place. Galway displayed better passing into the forward line and their defence swarmed the Cork forwards. Cork simply did not have all of the parts necessary to win their first game of the year, and played well in spurts, but not consistently enough to threaten their opponents. Galway had more options up front and the corner forward duo of Adrian Kelly and Brian Hanlon kept the Cork corner backs chasing all afternoon. Galway's Paul Cummins Comes out of Defence. Galway got off to a six point lead before Cork got a score up on the board. Brian Hanlon was busy in his corner forward position and was fouled for Adrian Kelly to put the first score of the game over the bar from a free. Hanlon then added a second and a third before Kelly put the fourth and the fifth point over the bar. Kelly and Hanlon maintained their duopoly on the scoring front for Galway before Cork got their first score of the game from Kieran Connolly. Galway’s passing was more coherent and the tribesmen defended in numbers when Cork had the ball. Cork always looked vulnerable at the back when Galway attacked. Hanlon added another score for Galway, and Peter Nolan and Greg Rogan rounded off an eleven point first half for Galway while the rebels mustered three. Wesley O'Brien and Kieran Lillis Tussle for the Ball. Cork made a few changes early in the second half and made some noise. After Adrian Kelly pointed for Galway, Cork won a penalty when Robert O’Kane was fouled in the box. Kieran Connolly took it, but the shot was too measured and Brendan Doherty saved comfortably. Niall Coakley got Cork within five points with two kicks of the ball. Coakley pointed a free and then the Carraigaline man put away Cork’s second penalty of the day. Substitute Kevin McCarthy was fouled just inside the area, and Coakley placed a well hit shot into the bottom corner. The sides traded points as Galway maintained their five-point lead. Adrian Kelly stretched the lead to six when Galway’s Alan Glynn was sent to the line with 10 minutes to go. Coakely pointed twice from free kicks to bring Cork within four points and there was hope for the rebels. Galway however, got their act together for the run in to the final whistle. Hanlon pointed a free and Greg Rogan followed with a well taken point. Galway took a short free and the St. Michael’s clubman made the finish look all too simple. Hanlon rounded off the scoring with a free kick to get Galway off the mark in the standings. Cork: R. Phelan, J. Leonard, C. Caffrey, K. Reid, A. Cahillane, D. Kerins, W. O’Brien, R. O’Kane, S. Keaney, K. Connolly (0-2), P. Healy (0-1), J. Monahan, N. Coakley (1-5). Galway: B. Doherty, S. Melia, A. Glynn, JJ O’Neill, K. Lillis, P. Cummins, S. Gallagher, G. Rogan (0-2), P. Howard, T. Walsh, P. Nolan (0-1), A. Kelly (0-8), B. Hanlon (0-7). Christopher's looked the most impressive of the senior football teams in action last weekend. Donegal and the Wolfe Tones each sputtered to victory, while Christopher's played some very good football to defeat the Gaels. In senior hurling Tipperary comfortably beat Cork, and it looks like it could be another Tipp versus Wexford final unless Galway can find a gear to pick up their performances a bit. (Reports below). The Tir na nOg ladies senior footallers pretty much blew away Roscommon by a score of 7-18 to 0-3. On the junior football front, McAnespies junior A side beat Cork well, and they sit jointly on top of the table with Cork and Donegal, while the Wolfe Tones are in fourth place. The Tipp junior hurlers easily beat Galway, 1-14 to 1-4, and Wexford beat Tom's. Wexford and Tipp top the junior hurling table, with Tom's and Galway each still looking for a win. This was a benign looking fixture. With Cork’s season not shaping up the way the rebel footballer’s at home is going, and the Tones setting themselves up for another playoff appearance, it took a surprisingly long time for matters to be effectively settled. Cork kept themselves in the game until the final five minutes of play thanks to a flurry of scores towards the end of the first half and some good displays in the back line in the second, which was helped by some ineptitude shown by the Tones until Steven Donaghy finally put the nail in the coffin with a goal five minutes from the end. A couple of injuries to Tadgh Healy and Robert O’Kane also did not help Cork’s cause. Wolfe Tones wing back Brian Maguire looks for a colleague. A Wolfe Tones runaway would have expected, and after fifteen minutes of play it was looking as though that may be the case. Cork to their credit came back into the game and having trailed by five points, reduced the deficit to two at the half as they pushed hard for the last 10 minutes. 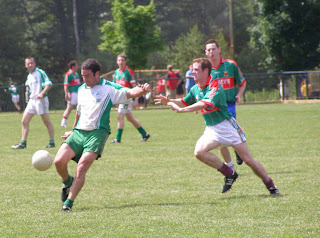 Wolfe Tones looked sluggish, and perhaps a little complacent, but did not get any flow to their game. The South Boston side established an early lead. Points came from Sean McVeigh, Donaghy, Marty Farrell, Brian Maguire, and Gary Sayers. Cork looked to be in for a slow death. Not so. The southerners sprang to life in the last ten minutes of the half and the combined shooting of Kieran Connolly and Jared Monaghan pulled the rebels to within two points at half time. Sean McVeigh looks like he got the better of this kickout. The second half was a story of missed chances and disjointed play for both sides, neither side showed much direction in their play – and some lengthy stoppages early on may have contributed as the Tones looked like they set out their stall to put their opponents away early. Cork showed some determination in the back line, Aaron Cahalane and Paul Healy dug in. Unfortunately Cork could not convert possession into scores. The ball was handed back to the Tones backs time and again. As time went by the writing was on the wall. Tones had some good goal chances, Dan McCabe came close twice, and eventually Stephen Donaghy got the goal that ensured the points for the Tones. Donaghy got on the end of one of the best moves of the game as he steamed through the middle to bury the ball from close range. The Tones added three more points to embellish the scoreline, but will surely be looking for a better display the next time out. Tones: D. Lyons, E. McHugh, P. Warren, D. Walsh, S. Scullane, B. Maguire (0-2), C. Canning, S. McVeigh (0-3), G. Sayers (0-2), S. Donaghy (1-2), . Comerford, M. Farrell (0-5), D. McCabe (0-1). Cork: R. Phelan, J. Leonard, A. Cahalane, W. O’Brien, P. Healy, D. Kearns, J. Monaghan (0-5), R. O’Kane, S. Kearney, K. Connolly (0-2), C. Caffrey, N. Coakley, M. Lyons (0-1). Tipperary put paid to a game Cork side with a good display from the half back line and some timely goals late in the first half. As would be expected from an encounter between the Munster giants, the game got a little testy and referee Trevor Kelly saw fit to issue some yellow cards on occasion to keep the players minds focused in the right direction. After establishing an early lead, Cork conceded three quick goals before half time, which ultimately proved to be their undoing. 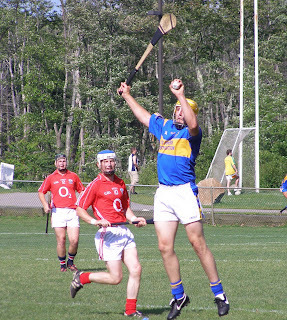 David Young played well at center back for Tipp . Cork took the field well kitted out and started the game well to boot. Paul Mannix saved well early in the game to prevent a Tipp goal, and Ronan Good opened the scoring with a fine point from wing back. Shane Menton answered for Tipp, while Mike Allen and Paul McGrath then traded points. Cork’s good play was rewarded with a goal after 10 minutes. Allen made a run and handpassed across the face of goal for Darragh Cotter to double on from close range. Cork stretched the lead to four points, and Kelly issued the first of the bookings as the niggle crept in. Tipp lifted their game on the half back line, thanks in large part to David Young and Eoin Ryan, and the lift in their efforts was underlined by a determined score from Paul McGrath. However, the rebels seemed to be holding their own. Then Tipp struck with three quick goals in the last 10 minutes of the half. Pat Howard booted the first over the line after a great run from midfielder Brian Howley, then a minute later David Young dropped a tame looking high ball into the box and Shane Menton stretched to clip the ball into the corner of the net. Just before the half time whistle, Menton scored Tipp’s third goal to put them five points ahead. Mike Allen pulled a point back for Cork just before the half time whistle. Tipp's Brian Howley bursts through the Cork rearguard to set up Tipp's first goal. Cork tried to lift it in the second, but never got closer than the four points that separated the teams at half time. Tipp pointed through Paul McGrath right from the re-start, and Menton and Pat Howard added to the Tipp tally. Then two more bookings came. Allen and Michael Lyons got Cork back to within four points, but then a Tipp goal effectively ended the contest. A ball down the middle was left up to Paul Mannix in goal for Cork and Pat Howard to challenge, and the ball ended up breaking into the back of the Cork net. End of story for Cork. Cork did continue to press but could not penetrate the Tipp rearguard, who did well when called upon. Tipp added scores from Menton, and a fine point from Young. Pat Howard and Cronan Dempsey put the icing on the cake with scores at the death for Tipp to put them into a solid second place in the standings. Cork: P. Mannix, K. Price, R. Devereaux (0-1), R. Good (0-2), T. Healy, W. O’Brien, B. Butler, J. Fitzgerald, M. Lyons (0-2), D. Cotter (1-0), E. Hegarty (0-1), B. O’Loughlin, M. Allen (0-6). Tipp: J. Howard, M. Heffernan, J. Heffernan, E. Ryan, D. Young, N. Ryan, C. Dempsey (0-1), B. Howley (0-1), C. McGrath (0-1), C. Hynes, P. Howard (2-2), P. McGrath (0-4), S. Menton (2-4). It must feel somehow unjust to score 15 times to 10 for your opponent and to still lose the game. Galway found themselves at the end of just such as result against an as yet to be beaten Donegal, who put in a second unconvincing performance in a row in spite of coming out on the winning end. Sometimes they say a sign of a good team is one the wins even after playing badly, whether this proves true in Donegal’s case remains to be seen. Donegal built their victory on the back of four first half goals. After Galway got on the scorebard first through an Adrian Kelly point, Donegal goaled through the St. Eunan’s Letterkenny youngster, Ross Withery. Donal Redmond fired back with a point, and Kevin Curran and Eddie Mannion added two more for Donegal. A second goal came from a penalty after Peter Fahy was fouled in the area and Cormac Mullen made no mistake with his shot. It was all Donegal as Fahy and Mangan added to Donegal’s lead, while Kelly pulled a point back for Galway before half time to make it Donegal 4-4 and Galway 0-3. 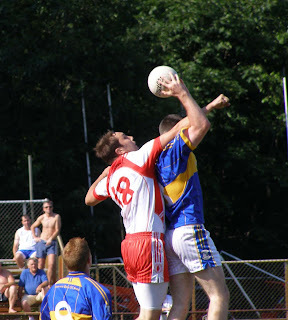 Donegal's Cahir Healy and Galway's Adrian Kelly contest a high ball. Galway came back strong in the second half and if there was more time could have stolen the game. Donegal, it must be said, seemed happy to rest on their laurels, a habit not worth getting into. Galway fired on all cylinders to get back into the game and had the trusty boot of wing forward Pauric Howard to thank for some very good free taking. Galway were full of running as they proceeded to eat into the Donegal lead. After Eddie Mangan pointed for Donegal, Greg Rogan got the ball rolling in the other direction with a pointed free. Howard added three frees, and Kieran Lillis pointed as he powered through from center back. Mangan stemmed the Galway tide briefly with a point, but the tribesmen kept on coming, playing the ball well from their back line. Howard added another point, and with time the enemy Galway needed a goal. Donegal funneled back to protect the goal, and limited Galway to points. A couple of late Howard frees brought Galway back to within a goal, but the final whistle sounded too soon from a Galway perspective – and just about in time from Donegal’s. Galway: B. Doherty, S. Gallagher, A.Glynn, J. Kehoe, K. Lillis, P. Cummins, T. Walsh, B. Glynn, P. Howard, G. Rogan, D. Redmond, A. Kelly, B. Hanlon. Donegal: F. Murphy, S. Lee, C. Healy, M. McGowan, S. Hannon, P. Fahy, D. McNulty, P. Kelly, R. Withery, C. Bell, K. Curran, E. Mangan, C. Mullen. The Irish Youth Sports League Field Day was held Saturday morning at the Irish Cultural Center, Canton Massachusetts. The Trinity Youth Gaelic Footballers participated and had a great run out. It's amazing watching them pick up the skills. Our youngsters played two games, the first against the Irish Sports Youth League and the second versus St. Brendan's. The ISYL and Brendan's generously let us borrow some players as there were a few who could not make it, and all the kids looked like they had a great time. There were teams from age under 6 to under 16 from Massachusetts, Connecticut, New York, and Pennsylvania participating. Football and hurling were played. The place was a hive of activity and it was a great day for parents and kids alike. The tee shirt below contains the names of the clubs that participated. 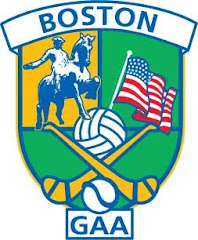 Massachusetts - ISYL, Trinity, St. Brendan's, Acton, John Boyle O'Reilly Club. Connecticut: New Haven, Hartford. New York: Rockland, St. Bridget's. Pennsylvania: Philadelphia Shamrocks, Delco Harps, Delco Gaels. James Walsh heads upfield versus the Youth League Team. In a big game, where the opposing Gaels team needed the win to retain hopes of a senior championship, Christopher’s came up trumps and demonstrated that their unbeaten record is not an anomaly. Christopher’s had the benefit of an extra man for most of the game, but in fairness the Hyde Park men had started inflicting the damage well before Kieran Cox was shown a red card for a late high challenge on Eric Hegarty. 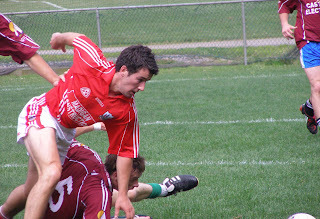 The 12-man Gaels started to stage a comeback early in the second half, but star forward Mark Dougan and Christopher’s John Kavanagh were each sent off for their part in a schmozzle, and with the game reduced to 11 men versus 12, Christopher’s took full advantage and ran away with it in the final 15 minutes. Christopher's Eric Hegarty heads for Goal. The Gaels struck first with two points in two minutes from corner forward Mark Dougan. Christopher’s sent a message as Eric Hegarty hit the side netting with their first chance. Brian Lonergan kick started things with a run from wing back to setup Hegarty for Christopher’s first score. 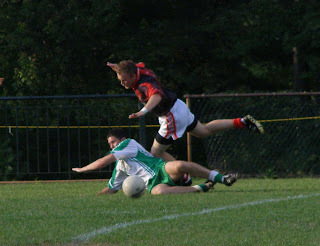 From that point on the Christopher’s corner forwards caused havoc in the Gaels back line. Christopher’s won a healthy amount of possession and played some good ball into the corners. Hegarty and Nemo Rangers prodigy, Finbarr O’Driscoll, had the Gaels back line looking for answers. They took full advantage of the ball played in to them as Hegarty slotted two points over the bar and O’Driscoll three in the following 20 minutes. After Hegarty scored the sixth point in a row for Christopher’s, Cox’s marching orders came. The Gaels switched wing back Colm Arkinson on to O’Driscoll, and the Corkman was somewhat quieter. However, Ian Rowland at wing forward stepped up and pointed three times in the final stages of the half. The Gaels struggled to get the ball into Dougan and Michael Martin, and when the westerners did get into shooting range, the result was not what was wanted with the ball either going wide or dropping short. Eventually a goal came, and it was well worked. Michael McGill started a move that Michael Martin finished with a fine shot into the roof of the net to keep the Gaels in with a fair shout. There were four points between the sides at the half, 1-3 to 0-10. Hegarty and Brian McLarnon tangle for posession. The Gaels got off the great start in the second half and evened things up within four minutes. Playing with a heightened sense of urgency, the Gaels were first to breaking ball in the middle of the field and chasing down any loose possession. Mark Dougan won a penalty and Galwayman Michael Martin executed the kick perfectly and made it a one-point game. The Antrim native then scored a superb point under pressure to level the scores with four minutes gone. However, things went all pear shaped from a Gaels viewpoint as one minute later Dougan became the second Gaels man to get his marching orders, along with Christopher’s corner back John Kavanagh, for their part in a free for all. Christopher’s went two points ahead thanks to Rowland frees, but the Gaels came back again. 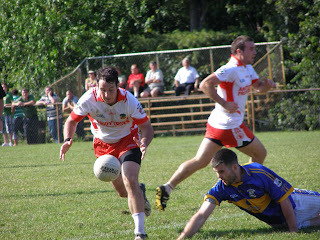 Colin Flanagan and Michael Martin (2) put three unanswered points over the bar as the westerners again raised their game. One wondered how long could the Gaels keep up the tempo. With 15 minutes left it was all to play for, but Christopher’s inched their way into the lead again as they started to regain midfield dominance. Sean Kelly pointed three times in three minutes and Rowland added a free to put Christopher’s four points ahead. The Gaels continued to press for some scores, however with the backs caught upfield, a goal came that killed off the game with seven minutes to go. O’Driscoll got on the end of a breakaway move and netted with aplomb to put Christopher’s seven points ahead. Christopher’s went on to add another 1-6 before the final whistle and are sitting nicely on 10 points – and still to be beaten. The Gaels may still have a chance, but that could depend on other results. Gaels: R. McCrystal, M. Kelly, D. McLarnon, C. Arkinson, A. Flanagan, C. Conroy, M. McGill, C. Larkin (0-1), K. Cox, C. Flanagan (0-1), J. O’Brien, M. Dougan (1-3), M. Martin (2-2). Christopher’s: R. Graber, N. Ryan, J. Kavanagh, B. Lonergan, E. Coter, P. Hogan, W. Kennedy, D. Kenneally, I. Rowland (0-10), S. Kelly (0-4), B. Kelly, B. O’Driscoll (2-4), E. Hegarty. (0-2). Sub: J. Kenneally (0-2). 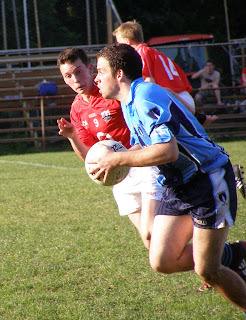 Top 4 make the senior championship playoffs, 5-8 make the intermediate championship playoffs. The last game of the day featured the hurlers of Galway and Cork. There were some flashes of good hurling from each side and some fine scores. 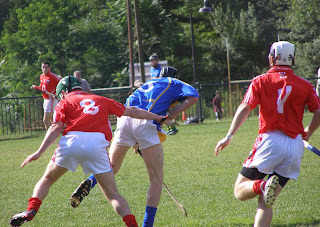 Unfortunately for those who came to see a good game of hurling, the main talking point after the game concerned the fighting that occurred on two occasions between almost all the players on the field. Galway opened the game looking like a comfortable win would be on the cards and led by eight points to three after 20 minutes. Cork came back with the last 4 scores of the half, one a goal, and set the stage for what should have been an exciting second period. However, rather than focus their attention on hurling, fights broke out where most players from each side joined in the fray. The epicenter of the first resulted from some off the ball jabbing with the hurley between Cork corner back Kevin Price and Galway’s John Moylan. 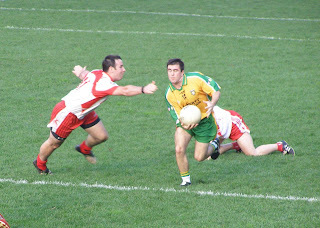 The second resulted from a dispute between Tadhg Linnane and Brian Lenihan where the players pulled across each other with the ball nowhere near. There were yellows issued after the first incident, after the second the colour changed to red as both players were sent off. Galway prevailed by a single point, but will take little satisfaction from the victory. 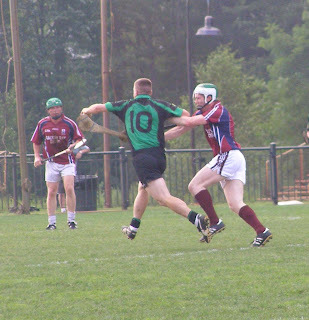 Galway's Sean Kelly turns for goal. Galway looked comfortable for most of the first half. Former Dublin U-21, Shane Murphy, was on target with most of his frees. There were also well taken points from Danny Fitzpatrick, John Moylan, and Richie O’Connell. Cork managed scores from Mike Noonan, a lovely point from left half forward Eric Hegarty, and two from Mike Allen. Leading by eight points to four, and not having looked to be under much threat at the back, Galway looked to be cruising to a comfortable win, but Cork had other ideas. Cork worked their way back into the game courtesy of a goal from Hegarty. Allen and Hegarty added a point each, to one score from Murphy to make it Galway 0- 10 and Cork 1-6 at the break. Cork opened the second half with three scores in a row, two Allen frees and point from midfielder Mike Noonan. Behind by two points, Galway started to work their way back into the game. Murphy put three frees over the bar and then John Moylan got on the end of a ball over the top and netted to put Galway four points to the good. With 20 minutes left it was all to play for. Cork got back within a point and then all hell broke loose and the game threatened to get out of control. Eventually, after lengthy stoppages, the referee got the players minds back on the game for long enough to see out the 60 minutes. Eric Hegarty and Brendan Barry traded frees for Galway to come out with the win. Galway: J. Byrne, T. Lenihan, P. Buckredge, G. Lyons, B. Barry (0-1), J. McCormick, J. Kinsella, M. Fagan, S. Murphy (0-9), R. O’Connell (0-2), D. Fitzpatrick (0-1), J. Moylan (1-2), S. Kelly. Cork: P. Mannix, K. Price, R. Devereaux, R. Good, T. Healy, W. O’Brien, M. Noonan (0-3), T. Fitzgerald, E. Hegarty (1-4), B. Butler, M. Lyons, M. Allen (0-7), B. Lenihan. Finally the rainy weather yielded to some sun and light breeze to create reasonably good conditions for a game of hurling. The grass was cut and the playing surface was the better than it has been all year. Wexford went into a comfortable lead in the first half and in spite of two late goals from Tom’s, the Slaneysiders always looked as though they would claim the spoils. Tidy play at the back and a forward line that spread the scoring around laid the groundwork for a comprehensive victory for the Wexfordmen to put them top of the table. Wexford's Peter Ryan and Fr. Tom's Donal Moore tussle for posession. The first half was a rather lackluster affair, underlined by the statistic that neither side scored from play until Tom Moloney put the ball over the bar with two minutes left in the first half. The highlights were a missed opportunity at goal for each side. First Tom’s corner forward Gerard Hennelly had a crack that just missed, and later in the half Wexford it was a great save by Tom’s keeper Aaron Bandon that kept Wexford from hitting the back of the net. Ryan O’Dwyer Stephen White and Tony Murphy shared the free-taking duties for Wexford, while for Tom’s it was Maurice Callnan. Callnan pointed from the dead ball four times for Tom’s, one a 70 late in the first half. Wexford’s free takers shared the spoils with two points each. Wexford played some tidy hurling out of their back line and O’Dwyer caused problems for Tom’s with his speed and quickness on the turn. As the game wore on the scores seemed to come easier for Wexford. After Maloney pointed from play it seemed to have the effect of signaling to his cohorts to do likewise, and O’Dwyer and White each followed. At the half Wexford were sitting on a comfortable looking five-point cushion. Wexford's Tony Murphy grabs the ball in a crowd. The Tempo of the game increased in the second half as Tom’s tried to get themselves back into the game. The sides matched each other for scores in the opening minutes. After Tony Murphy pointed for Wexford, Tom’s put two scores together for the first time in the game from Trevor Kelly and Callnan. Sean Herlihy and White then made it double scores as their points put Wexford into a twelve points to six lead. Tom’s introduced Fran Keenan and Michael Magill into the forward line in an effort to generate some return in that area of the field, and shortly thereafter Eanna Murphy. Wexford continued to hassle and harry at the back and Tom’s continued to struggle to improve matters in the scoring department. Their efforts finally bore fruit when a goal came from Murphy, with Michael Magill doing the set up work. Wexford added two more points from Tony Murphy when Tom’s struck with a second goal at the death. Trevor Kelly dropped a high ball into the crowded box, and it found it’s way into the back of the net. Any Tom’s hopes of a late comeback were dashed as it was a little too late and the final whistle sounded shortly thereafter. Wexford: G. Griffey, O. O’Shea, K. O’Rourke, P. Breen, J. Walsh, B. Dalton, D. Redmond, S. White (0-7), S. O’Herlihy (0-2), P. Ryan, R. O’Dwyer (0-3), T. Moloney (0-1), T. Murphy (0-4). Tom’s: A. Bandon, S. Staunton, P. Callnan, J. Dowling, C. Healy, D. Moore, T. Kelly (1-1), S. Howley, J. Cuddy, D. Dowling, M. Callnan (0-5), G. Hennessey, C. Moore. Sub: E. Murphy (1-0). Aiden McAnespies senior footballers tasted defeat for the first time in over a year at the hands of a determined and spirited Shannon Blues team. Once the Blues had the smell of victory in their nostrils, they kept working until the job was done. The Blues trailed for the first 40 minutes, but went ahead early in the second half with a well taken Colm McGee goal. The Blues then dug in until the very end and stifled McAnespies’ efforts at maintaining their unbeaten record. Philip Lydon gets his hands on the ball as Neil Donaghy challenges. Playing with a slight breeze, McAnespies took advantage and established a three point lead after 30 minutes of play. David O’Callaghan opened the scoring for the Blues. After that McAnespies went on a five points to one scoring spree. Colm McCrory and Alan Nestor shared the spoils. Usually taking the field at wing forward, McCrory lined out at corner forward to start the game, perhaps in hindsight for the northerners, McCrory’s trademark speed could have been better utilized on the wing. It seemed as though we were in for another routine win from the South Boston boys. However, in spite of playing second fiddle on the scoreboard, had The Blues taken their chances it would have been closer at the half. There were at least three good opportunities that went amiss. Eventually Phillip Lydon found the mark and Colm McGee displayed a flash of brilliance that was a harbinger of what was to come in the second half. The man from Tubbercurry scored a rousing point to lift the Blues at the end the half and made it a three point game. The Blues got off to the start they wanted in the second period with a point from a Lydon free kick. Jamie Kelly and Colm McCrory put McAnespies back into a four point lead with a point each. Then the Blues hit with a goal five minutes into the second half. Again, it was the Tubbercurry man, Colm McGee, who roused the Blues contingent with a fantastic goal. McGee ran on to ball played through the middle and tapped it past the advancing keeper, then placed the ball exquisitely into the corner of the empty net from a tight angle. Philip Lydon then leveled the scores with another pointed free kick. Frustration began to creep into McAnespies play, and bookings were issued to Neil Donaghy and also to Philip Lydon for the Blues. Again, McGee got them cheering in the stand on the Blues side of the field with another fine score to put the Blues in the lead two thirds of the way through the half. With time running down McAnespies started to lose their way with some wayward shooting and aimless kicking into the forward line. Fouling the ball when in possession on several occasions, and with some poor shooting, the frustration grew for the defending Boston and North American champions. The Blues could smell that a famous victory would be at hand and dug in at the back. Philip Lydon added to the Blues lead with 13 minutes still left to play. As McAnespies continued in vain to claw themselves back into the lead, the Blues put up a solid wall at the back to keep their opponents out. With a minute to go McCrory brought McAnespies within a point and set up a tense finale to the game. McAnespies pressed for the equalizing score, but Lydon put the insurance point over the bar in injury time and the Blues celebrated a fine win. The result opens things up at the top of the table as now Donegal and Christopher’s are the only teams yet to be beaten. Macs: D. Wright, C. Moore, N. McAdam, G. Clark, K. Hudson, F. McPhillips, N. Donaghy, C. Donnelly (0-1), D. Donegan, R. Maguire, A. Nestor (0-2), L. Sweetman, C. McCrory (0-5). Sub: J. Kelly (0-2). Blues: D. Hawes, S. Kelly, T. Wallace, B. Maloney, P. O’Brien, E. Mullarkey, P. Lydon (0-5), S. Gilmartin, L. McQuade, S. O’Mahoney, C. McGee (1-2), A. O’Donoghue, D. O’Callaghan (0-2). The Connemara Gaels demolished Mayo on Sunday afternoon. Needing a win to get back on track towards a senior playoff spot, the Gaels took care of business in a one sided game. In the second half the game degenerated into target practice for the Gaels forwards as Mayo were unable to match their opponents in any facet of the game. Midfielders rise as Kieran Cox (9) and Mike Carolan (4) ready themselves for the breaking ball. The tone was set right from the start as each of the Gaels' corner forwards helped themselves to a goal. Galwayman Michael Martin and Tyrone native Mark Dougan each netted in the first five minutes. After the Gaels went ahead on an unusual looking score of 2-0, Mayo pointed twice and it looked like there may be a game on. Barry O’Donovan and Dan Murphy each pointed for Mayo. However, it was not to be. The Gaels pointed seven times without reply as the traffic was all in one direction for the remainder of the half. 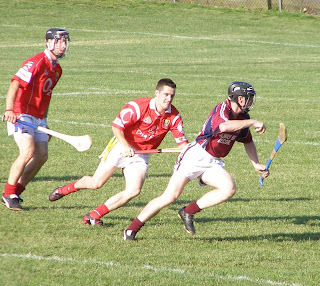 Dougan and Martin put six over the bar between them , while 2007 All-Ireland winning Galway minor John O’Brien accounted for the odd score from wing forward. The Gaels led by a score of 2-6 to 0-2 at the break. Michael Magill puts his second point over the bar. The second half continued as the first ended. The Gaels' subs got a good run as the westerners pointed eight times before Mayo scored a consolation goal in the final quarter. Derryman Fergal Doyle and Colin Harkin controlled matters in midfield, while at the back the Gaels defenders did not have too much to bother them. Paudi Walsh eventually put the ball away for Mayo with a good finish, but the goal had no impact on the game. The Gaels corner forwards continued their impressive shooting, and Michael Magill added a couple of points to the total. The win puts the Gaels back on track for a top 4 spot. Gaels: R. McCrystal, D. McLarnon, M. Kelly, C. Arkinson, A. Flanagan, C. Conroy, F. Doyle, C. Harkin, K. Cox, M. Magill (0-2), J. O’Brien (0-2), M. Dougan (1-7), M. Martin (1-5). Mayo: D. O’Malley, S. Clifford, M. Wynne, M. Carolan, J. Toner, P. Fleming, P. Walsh (1-0), D. Murphy (0-1), B. O’Donovan (0-1), C. Walsh. Saturday evenings throw up some of the best games of the year. With Kerry leading by 8 points and only 7 minutes away from pulling off an upset, Donegal’s Paddy Kelly fisted the ball over the goal line from close range. According to the umpires it was too close as both signaled for a square ball, but the call is not the umpires to make. Referee, Brian Gallagher adjudged the goal to be fair and it stood. Kerry were still leading by 5 points, but with their confidence now shaken and Donegal seeing a pathway to redemption having played so poorly for 50 minutes, the momentum took a massive swing. Donegal went on the score another goal and four points to steal the points from a Kerry side who wilted having worked very hard for 50 minutes. Paddy Kelly gets his fist to this ball in the first half. Kerry were clearly up for this game, their concentration and determination was evident in the team’s play all through the field. On the other hand, Donegal looked as if they were sleepwalking for most of the first 30 minutes. Kerry’s back line worked extremely hard in closing down the space for the Donegal forwards and the ball played ball into the forward line was very good. Mark McGowan opened the scoring for Donegal with a fisted point, and Kerry answered with two. Sean Kiley, who impressed at center forward, and Rory O’Neill at corner forward got their names on the scoreboard. After Eddie Mangan leveled affairs with a well-taken score after 10 minutes, Kerry worked themselves into a four point lead at the break. Winning possession from kickouts and breaking up Donegal moves, Kerry put five over the bar to one for Donegal for the remainder of the half. Donegal also had Ferghal Murphy to thank for two fine saves that prevented Kerry for scoring a goal. The first was a shot from Rory O’Neill, and Kerry were unlucky as Barry Kennedy was first to the rebound but his follow up hit the crossbar. Robbie Croft was denied late in the half as Murphy got down well to stop the Naomh Barrog clubman’s shot from the edge of the small square. After the restart Kerry continued to play with confidence and got the first score of the second half. Donegal looked as if they were trying to raise their game, but Kerry continued to put in the effort to maintain the lead. Rory O’Neill put a well worked score over the bar. Mark McGowan and Paddy Kelly pointed for Donegal, but Kiley split the posts twice for Kerry in response. After Mangan pointed from a free to bring Donegal within four points, that goal that seemed like it was coming all afternoon for Kerry finally arrived. Rory O’Neill netted from close rage following a move involving substitute George O’Keefe and the instrumental Kiley. After the sides traded points with Kerry eight points ahead, Donegal scored the controversial goal. Kerry still held a comfortable lead, but what followed was a complete reversal. Donegal undid in less than 10 minutes a lead that took Kerry 50 to build. Mangan played a big part in the comeback, and pointed to follow up the goal. Donegal now were the ones winning the kickouts and breaking up the Kerry efforts at moving downfield. Substitute Christy Bell blasted home a second Donegal goal with the clock winding down, and Mangan fisted the equalizer over the bar a minute later. Mangan then put a 35 yard free over the bar, and won the ensuing kickout to supply Paddy Kelly the ball for the insurance point. A cruel ending for Kerry, but a lesson learned perhaps. Kerry showed that they are capable of playing some high quality football. A good sign for Donegal, when the chance for redemption came the northerners grasped it with both hands. Kerry: J. Molloy, R. Dwyer, O. Murphy, C. O’Sullivan, F. Sullivan, M. Godley, J. Moroney (0-1), P. Corrigan, R. Croft (0-2), S. Kiley (0-4), L. Shorten, B. Kennedy (0-1), R. O’Neill (1-2). Sub: G. O’Keefe (0-1). Donegal: F. Murphy, C. Healy, S. Lee, R. McLaughlin, S. Hannon, M. McGowan (0-2), D. McNulty, M. McGinty, R. Wherity (0-1), P. Kelly (1-2), G. Hoey, C. Mullins (0-1), E. Mangan (0-5). Sub: C. Bell (1-0). There were two other senior football games played Saturday. The Wolfe Tones easily beat Armagh-Notre Dame, while Christopher's continued their unbeaten streak with a five point win over Galway, 3-11 to 1-12. In junior football the New England Celtics are still looking for their first win, Cork came out winners by a score of 1-11 to 0-9. Finally the weather has improved, and hopefully the fixtures that were postponed can be made up reasonable time (even though as I write this there are thunderstorms outside). The playoff spots have to be decided in the next 6 weeks. Make up games aside, next Saturday sees 2 senior football championship games, Wolfe Tones play Armagh-Notre Dame, and Donegal play Kerry. It would take an upset of major proportions if we do not see the Tones and Donegal adding two more points each. Sunday presents a more interesting encounter as Mayo and Cork meet. Can Cork pick themselves up after last weekend's defeat and salvage something from the season? Also, McAnespies and Shannon Blues meet in the 5:00 game. Macs will be favoured to win, but the Blues will give them a real test of where they stand and whether they can make it 5 championships in a row. There are 2 senior hurling games on the card. Tom's play Wexford - Wexford will be comfortable favourites for that one. Cork and Galway also face off, I have not seen Galway play this year, but Cork could look at this as a chance to add to their victory over Tom's in their last game. Hard times for Armagh-Notre Dame and Cork these days. The northerners prevailed in this bottom of the table clash that at times it seemed neither side was too interested in winning. For much of the first half it looked like it was Cork’s game to lose, only for Armagh-Notre Dame to storm into a 10 point lead in the second half, and almost give it up at the death as Cork came back within a score of salvaging a point. Darren Gilsenan pops one over for Armagh-Notre Dame. Cork held a slight advantage at the end of the first period. The rebels looked the better side for the opening quarter and built up a five point lead, but Armagh-Notre Dame buckled down and played their way back into it as the half wore on. Jared Monahan was the main link in the middle of the field for Cork, and the former Derry under-21 also took the lead role in the scoring department. Monahan scored the first five points for Cork, and it was wing back Wesley O’Brien who brought some diversity to the scoreboard as the Cork forwards were not exactly firing on all cylinders. Niall Coakley was the only player named in the starting forward line to get on the scoresheet in the first half with a well taken goal, and followed with a point at the end of the half. Armagh-Notre Dame did not do much better with their front five. Darren Gilsenan and Niall Forde were the only forwards to put the ball between the posts in the first half. It was up to the midfielders and half backs to make inroads on the scoring front. Frank Meehan, Rory McClelland, Brian Boylan, and Gavin Gilsenan came running through from midfield and the half back line to put a dent in Cork’s lead. At the half Cork led by 1-8 to 0-9. Armagh-Notre Dame came out all guns blazing in the second half, and could not have wished for a better start. Darren Maguire netted twice in quick succession. Aiden Blake provided the pass for the first goal, and the Fermanagh man’s second came from Cork’s failure to clear the ball properly. Maguire duly took advantage and slipped the ball past Eddie O’Driscoll in goal for Cork. Cork had their goal chances but misfired on one occasion and on the other Ciaran Molloy saved well. Darren Gilsenan made it three in the goals column for Armagh-Notre Dame and suddenly Cork were facing a 10-point mountain. Cork started a fight back in an effort to salvage something from the game, having introduced a raft of substitutes. Their opponents seemed happy to play their part in the drama by allowing their opposite numbers back into it. Coakley pointed twice on the trot, and Monahan provided a fitting finish to a lovely move to bring Cork within five points. Wesley O’Brien provided a goal with a sublime finish at the death to provide some hope of a last gasp reprieve for Cork, but the last chance high ball was cleared by the northerners. The season does not look to hold much promise for either side. That said, Cork have some quality footballers in Monahan, O’Brien and center back Tadhg Healy, while Rory McClelland and Damien Burke for Armagh-Notre Dame showed some steel when the chips were down. Armagh-ND: C. Molloy, N. Lennon, A. Doyle, F. Meehan (0-1), D. Burke (0-1), R. McClelland (0-1), B. Boylan (0-1), G. Gilsenan (0-2), D. Maguire (2-0), F. McClelland, N. Forde (0-2), D. McGill, D. Gilsenan (1-3). Cork: R. Phelan, A. Cahilane, J. Leonard, W. O’Brien (1-2), T. Healy, C. Caffrey, J. Monahan (1-5), R. O’Kane, P. Mannix (0-1), K. Connolly, D. Kerins, N. Coakley (1-3), M. Lyons. Sub: S. Keeney (0-1). The scoreline tells the story for this game. A comfortable win for McAnespies who had little to worry about once they took the lead after 5 minutes. Mayo never looked like they felt that they could pull off an upset and for much of the game the outcome was inevitable. Don O’Malley managed to keep a clean sheet for Mayo for 59 minutes, until Colm McCrory netted at the death to rob Mayo of even that bright spot to an otherwise forgettable day for the westerners. Keith Hudson has matters in hand at center back for McAnespies. Once things got warmed up McAnespies started to cruise and opened up comfortable lead. The sides were on a level footing after five minutes with 2 points each. Keith Hudson and Colm McCrory pointed for McAnespies, while Barry O’Donovan was on the mark for Mayo. Once Alan Nestor put McAnespies one to the good from a free the South Boston side cruised without looking like they were overextending themselves. The only interruption to the one way traffic was a point from Barry O’Donovan. Mayo did make an occasional foray into McAnespie’s territory, but the Macs back five mopped up with reasonable comfort. Colm Donnelly finished an incisive move to put McAnespies four points to the good after 15 minutes, while McCrory and Nestor clocked up the points tally between them. At the half McAnespies led by 0-11 to 0-3, and all the while looking like they could raise the tempo if needed. Kevin McAllister finds room to play the ball into the corner. The second half continued as the first ended. A Rory Maguire point was followed by a pointed McCrory free. Barry O’Donovan bucked the trend and netted for Mayo, after Stephen Hughes supplied the pass, finishing the best move of the afternoon for the westerners. Macs answered with three points over the following five minutes. Colm McCrory picked things it up in the speed department and finished two sweeping moves for points, though it was clear that a goal was on his mind. Luke Sweetman got credit for the third point. Sweetman had the goal at his mercy, but Don O’Malley got down well to deflect the shot over the bar. Mayo kept Macs from netting a goal and put some respectability on the scoreboard, and seemed to apply themselves a bit better late in the day. There were a couple of occasions where McAnespies defence had to put some work in. Kevin McAllister pointed twice for Mayo, one could have been a second goal for Mayo but the ball floated over the bar from close range. McCrory eventually put one in the goal column for McAnespies. With time almost up, the Monaghan man put first time shot in the top corner from close range denying Mayo a clean sheet. Macs still unbeaten, while Mayo are no doubt looking to put this one behind them. Macs: D. Wright, S. Magill, C. Moore, G. Clarke, K. Hudson (0-1), F. McPhilips, C. Donnelly (0-2), N. Donaghy, D. Donegan, C. McCrory (1-8 – 4f), A. Nestor (0-5), L. Sweetman (0-2), R. Maguire (0-1). Mayo: D. O’Malley, S. Clifford, M. Wynne, M. Carolan, J. Toner, D. Murphy, M. Coakley, P. Walsh, J.Carney, P. McHale, S. Hughes, K. McAllister (0-2), B. O’Donovan (1-3). Having played second fiddle to Wexford for the last 3 years, Tipperary looked eager to turn the corner in an intensely fought game of hurling. While the field had dried out significantly, surface conditions were still heavy and the sides labored to produce any kind of crisp quality to their performances. Referee Shane Sinnott issued three yellow cards and a red in the first half, but the game was still marked by some bouts of fisticuffs and heavy challenges that sparked unsavoury reactions. After losing Andy McRedmond to a sending off in the first half, Tipp were always playing from behind, and Wexford’s dominance continued as they seemed to have more weapons in the scoring department. Tipp corner back James Heffernan tries to escape the attention of Wexford's Tom Moloney. Tipp opened the game brightly. Tipp center back David Young struck a fine free from range and Pat Howard followed with a second soon afterwards. Referee, Shane Sinnott, was called to action early and issued yellow cards to Young and Wexford’s Ryan Dwyer following a schmozzle after Dwyer felt that Young unfairly impeded him when going for the ball. Wexford’s first score of the game, a Ryan Dwyer scrambled goal, put Wexford into a one-point lead. Pat Howard leveled matters with a free after Tipperary lost Andy McRedmond to a straight red card – Dominic McGill received a yellow for his part in the episode. Wexford used the extra man well in the full back line, and Tipp’s lobs into the Wexford full back line were promptly returned. Eoin Ryan stood out at wing back for Tipp as they ceded the initiative to their opponents. Tony Murphy pointed back to back frees to put Wexford into a lead that they did not relinquish. Stephen White and Ryan Dwyer added to the lead before Tipperary scored again. After Howard and Dwyer traded points, Wexford’s second goal came from the stick of Ger Griffey. Griffey took a free on his own 21, and the ball carried all the way to sneak under the crossbar of Jim Howard who also had the sun to contend with. A fortunate score at a great time for Wexford, quite the opposite for Tipp. At the half things looked good for Wexford; a seven point lead on the scoreboard, and a man advantage on the field. Tony Murphy has goal on his mind as he runs through the Tipp back line. Things got interesting in the second half as 12-man Tipp mounted a valiant fight-back. Tipp raised the intensity at the back and Wexford did not look so comfortable. Two Tipp goals brought them right back into the game. Brian Lonergan netted five minutes after the restart, and after 16 minutes Pat Howard had Tipperary within 2 points of their opponents. Howard got on the end of a dropping ball into the box and tapped the ball into the past Griffey into the Wexford net. Truth be told, David Young was a fortunate man to remain on the field following a bad challenge from behind that could easily have resulted in a second yellow, and later escaped following his reaction to being penalized for a free. Tipperary introduced Shane Menton who took over the free taking duties. The first three efforts sailed over the bar as Tipp cut into Wexford’s lead. Stephen White was also accurate from the placed ball in his free-taking duties for Wexford, and along with Tony Murphy, kept Wexford a score or two in front. With 2 minutes to go Tipp were within a goal of evening things up, but Murphy made it safe for the Slaneysiders with a well taken point. With Tipp needing 2 scores, Menton decided to take the easy score with a close range free, and Tipp pressed for the equalizing goal. 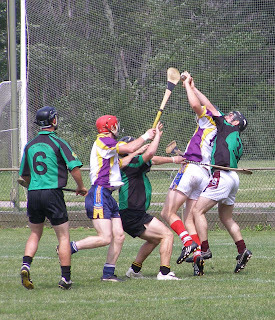 Wexford put bodies in the box, and held out to reaffirm their status as the team to beat in Boston. Tipp: J. Howard, M. Heffernan, J. Heffernan, E. Ryan, D. Young (0-1), C. Dempsey, M. Jordan, C. McGrath, P. McGrath, A. McRedmond, P. Howard (1-4), B. McFall, B. Lonergan (1-0). Sub: S. Menton (0-4). Wexford: G. Griffey (1-0), O. O’Shea, C. Rourke, B. Dalton, D. McGill, J. Walsh, D. Redmond, S. White (0-5), T. Bonner, R. Dwyer (1-2), T. Murphy (0-5), T. Moloney, S. Herlihey. After 6 weeks of hard training, the kids from the newly formed Trinity Youth GAA club played their first game of football against intense local rivals, St. Brendan's of Dorchester. Seriously, this was the first time any of the kids from either side actually played a game of Gaelic Football. Most of the kids were aged from 4 to 7 years old and had lots of fun, as did the parents and supporters on the sidelines. Seamus Buckley did a great job refereeing and doing the "in game" coaching of the kids and the youngsters seemed to get the hang of it the more they played. There are more games on the horizon in the next few weeks as the fun continues! Chris and Tara organize the troops before the big game. Nessan minding the net for Trinity. Brady Vrettas on the attack! St. Brendan's attack as James, Declan and Kevin defend for Trinity. Handshakes all around after a great game of football.